The term “franchise tax” can cover a wide variety of tax structures. In general, a franchise tax is a tax on corporations that is separate from the corporate income tax. Most states impose a fixed or graduated fee on corporations incorporated or doing business there, but the term “franchise tax” is most commonly used to describe a tax based on some measure of a company’s net worth or capital value. In most cases the franchise tax pre-dates the corporate income tax. This article outlines Illinois’ franchise tax, including its history, revenue generation, outlier status, and administrative complications. What is the franchise tax? Answering that question starts by explaining what the franchise tax is not. 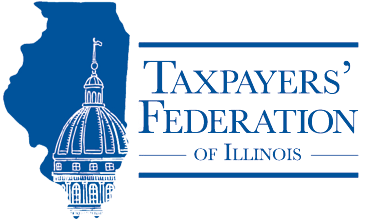 The Secretary of State administers Illinois’ franchise tax along with a number of fees. For example, corporations pay $150 to file articles of incorporation, $50 to amend articles of incorporation, $25 to change registered agents, and so on. There is also a $75 fee to file a corporate annual report. Although revenues from these fees are frequently lumped together with those from the true franchise tax, we focus here only on tax itself, and not on the activity-based fees. The franchise tax was originally conceived as a fee companies paid for the privilege of being considered “corporations.” It was enacted in Illinois in 1872, when the “corporation” as a modern American institution was a relatively new idea. Illinois state law authorized the formation of corporations in 1849, and in 1855 the United States Supreme Court officially devolved power to form, alter and revoke corporate charters to the states. Under the new corporate system, individuals were protected from the debts incurred by the businesses they owned and operated. The franchise tax was essentially a payment from a group of individuals for the rights associated with being a corporation. Illinois’ franchise tax is actually three separate taxes, all based on paid-in capital. The term “paid-in capital” refers to the funds raised when a corporation issues stock plus any additions to capital, such as land granted by the government to the corporation or subsequent investments by shareholders. Paid-in capital is not revenue, nor is it net worth; instead, it is the money used to build a business. When a corporation first registers with the Secretary of State it pays an “initial tax” on its paid-in capital in the state, at a rate of 0.10%. Each year thereafter, a corporation pays an “annual tax” on its paid-in capital in the state at the same rate (0.10%). Finally, there is an “additional tax” on increases to paid-in capital, imposed at a higher rate (0.15%). The annual and initial taxes have a minimum of $25 (over and above the $75 annual report filing fee) and a maximum of $2 million, but the additional tax has no cap. How much revenue does the franchise tax generate? Frequently, the true franchise tax is lumped together with other fees imposed by the Secretary of State. When evaluating the fiscal impact of the franchise tax itself, though, it is important to separate out those filing fees. Taxes on paid-in capital, the three components of the franchise tax, raised $179 million in calendar year 2018, about 0.47% of general fund tax revenues. Contrast this with the corporate income tax, which raised more than $2.6 billion in fiscal year 2018. Table 1 below shows the number of filers and total revenue generated by the various components of the franchise tax. The franchise tax does not raise a significant amount of revenue today, and this was the case even at the time of its enactment. In an article published in October of 1873, the Chicago Tribune noted that “A State tax of $40 each on all the liquor-saloons in Illinois would produce more money to the State Treasury than the Board of Equalization will ever get by trying to tax the premium value of capital stock in private corporations.” In that editorial, the Tribune made the argument that there were better ways to charge companies for the privilege of operating as a corporation than a tax on paid-in capital. As Table 1 indicates, a small percentage of corporations in Illinois account for most of the franchise tax revenues. In fact, 95% of corporations in Illinois account for just 6% of revenues from taxes on paid-in capital. In essence, even though all corporations face the additional burden of calculating and paying their franchise taxes, most of the revenues the tax raises come from only a small portion of filers. While most states charge corporations an annual fee to operate in their state, Illinois is one of only a few states to tax corporations based on a measure of their net worth, paid-in capital, or capital stock. The map below shows states’ various franchise taxes. New York and Mississippi are in the process of phasing out their taxes (Kansas, Missouri, Ohio, Pennsylvania, Rhode Island, and West Virginia have all repealed similar taxes in recent years), leaving only Illinois and thirteen other states with a tax like this. 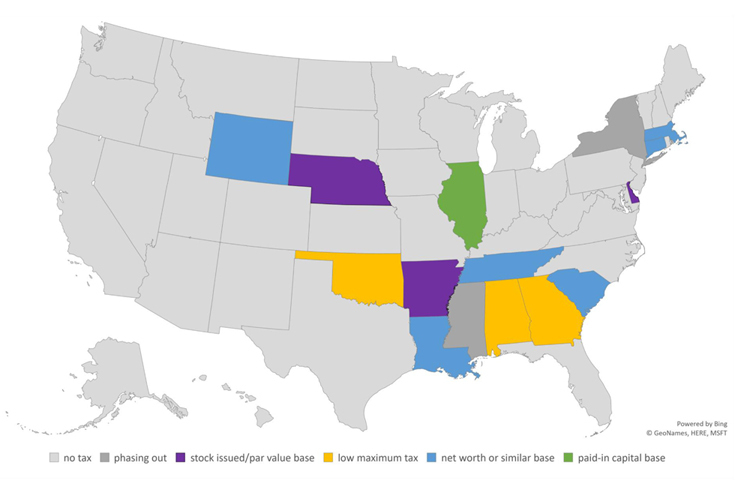 Of those, three (Arkansas, Delaware, Nebraska—a biennial tax) are based solely on the number of shares issued and par value of the stock, rather than on the value of the entity or its capital. The maximum tax payable in Alabama ($15,000), Georgia ($5,000), and Oklahoma ($20,000), while not de minimus, effectively turn the tax into a graduated annual filing fee. There are only seven states that impose a tax roughly equivalent to Illinois’ franchise tax. Those remaining states (Connecticut, Louisiana, Massachusetts, North Carolina, South Carolina Tennessee, and Wyoming) base their taxes on a more traditional base—total assets or net worth (or the equivalent) as reported on an entity’s books and records or on its federal income tax return. The franchise tax is a flawed tax. When he first proposed repealing the business capital component of the state’s corporate tax, then-Governor Andrew Cuomo’s office made the following statement: “New York’s corporate franchise tax is largely outdated and its complexity results in lengthy and complex audit processes that take businesses years to resolve. “ Illinois taxpayers share a similar sentiment regarding the Illinois franchise tax. A tax on net worth or capital stock is problematic because it can result in pyramiding—a single investment may be taxed multiple times. It is not unusual for businesses to operate using multiple legal entities under a parent corporation. This can be the result of any number of possible considerations—regulatory requirements, accommodating new investors, or it may simply be a legacy of business expansion. Whatever the reason for its existence, this very common structure frequently leads to an unfairly disproportionate tax liability. For example, assume two investors form Company A with $10,000. Company A flourishes and after a few years decides to expand into a slightly different business, so it forms a new subsidiary. That original $10,000 is no longer needed at Company A, so it invests it in Company B. A few years later, Company B purchases 90% of the stock of an existing venture in the same line of business—Company C—for $10,000. Each year thereafter, that original $10,000 investment is taxed under Illinois’ annual franchise tax 3 times because it is part of the paid-in capital of Companies A, B, and C. This pyramiding has the effect of punishing businesses that expand. Similarly, the additional paid-in capital component of the franchise tax is directly targeted at those businesses that are growing and expanding. The Illinois franchise tax was designed to be a fee paid by a business for the right to be treated as a corporation. Using paid-in capital as a proxy for the benefit (or value) owners receive from incorporation, however, makes little sense. Corporate owners derive value from their franchise because their separately held assets are protected from corporate liability, but any amounts invested in the corporation are at risk. The more paid-in capital a corporation has, and therefore the more its owners have paid in, the more the owners stand to lose in the event the corporation cannot pay its debts. All else being equal, the value to owners of a business’s operating as a corporation decreases as paid-in capital increases. Franchise tax liability, however, increases. The choice of paid-in capital as the basis of the franchise tax was controversial even in 1872, so much so that Chicago railroad companies fought the tax all the way to the U.S. Supreme Court. They argued that paid-in capital was an inappropriate, vaguely defined basis for the tax, and that the tax was unconstitutional. In its decision in favor of the State of Illinois, the Supreme Court said that Illinois’ method of determining a corporation’s tax liability was “probably as fair as any other” method. Hardly a resounding endorsement, even then. Illinois’ franchise tax has its own unique quirks, making it an outlier even among the few states still imposing this kind of tax. As discussed above, Illinois does not use net worth or any standard measure of corporate value as its tax base; Illinois taxpayers must track and maintain separate calculations solely for the purpose of paying this tax. Similarly, Illinois’ franchise tax is administered by the Secretary of State rather than the Department of Revenue, which means separate filings, separate due dates, and a separate administrative regime. The apportionment method for Illinois’ franchise tax is different from that used for Illinois’ income tax, and from any apportionment method used for any other state’s tax. The apportionment formula used by Illinois is the sum of (1) the value of the corporation’s property (including intangibles) located in Illinois and (2) the gross amount of “business” (interpreted to mean gross revenues) transacted by it at or from places of business in Illinois. Divide this by the sum of (1) the value of all of its property, wherever located, and (2) the gross amount of its business, wherever transacted. In other words, corporations’ franchise taxes depend on the share of their property and business that are geographically located in Illinois. This apportionment method makes Illinois less competitive with its peers economically, and it creates an administrative burden. The economically disadvantageous nature of the franchise tax apportionment formula is obvious when it is contrasted with Illinois’ apportionment formula for corporate income taxes. Illinois, like many states, apportions its corporate income tax based solely on a corporation’s sales volume in Illinois. A business can expand its facilities and hire more employees in the state without increasing its Illinois income tax liability, thereby encouraging in-state expansion. Illinois’ franchise tax apportionment method penalizes corporations that have located or expanded their operations in the state. In addition to the economic disadvantages to the state from using property in the apportionment formula, there is an administrative disadvantage as well. This complicated formula is used only for one purpose—the Illinois franchise tax. All corporate income taxes are apportioned, including the Illinois income tax, but none use this particular formula. As a result, it is time-consuming and costly to calculate, both for taxpayers and the taxing agency. Has the franchise tax outlived its usefulness? At the time the franchise tax was enacted, corporations did not pay a corporate income tax. The franchise tax was conceived as a way for corporations to pay for the relatively new legal protections granted them by the state, and paid-in capital was likely chosen as a tax base because it was one of the only visible bases for the tax. Without a federal income tax system, corporations could easily misreport their incomes to the state. Options were limited, so paid-in capital (an amount shareholders would insist corporations track properly) was taxed by the state. Today the situation is different. Corporations are subject to a wide variety of taxes, including the much more substantial corporate income tax. Corporate incomes are both visible and measured accurately by the Federal and State Government. On the other hand, the administrative and policy flaws associated with the franchise tax are significant. “Bill Filed by the Chicago Plow Company.” Chicago Tribune, December 25, 1873. See 805 ILCS 5/15.35 through 15.45 and 15.65 through 15.75, all part of the Buseinss Corporations Act of 1983, for the relevant statutory provisions regarding the imposition and calculation of the franchise tax. Commission on Government Accounting and Forecasting, Economic Forecast and Revenue Estimate and FY Revenue Update, March 5, 2019, page 36. This was the State agency that levied the franchise tax at the time. “Taxes on Franchises.” Chicago Tribune, October, 1873. Source: data from Illinois Secretary of State Business Services Division for calendar year 2018, March 18, 2019. Press Release, January 6, 2014. Accessed March 11, 2019. State Railroad Tax Cases, 92 U.S. 575, 576 (1875). * President of the Taxpayers’ Federation of Illinois since January 2013, Carol Portman has been working in the state and local tax arena for over two decades.